Ribbon is cut: everybody on the ice. The new Martha’s Vineyard Arena is now officially open. 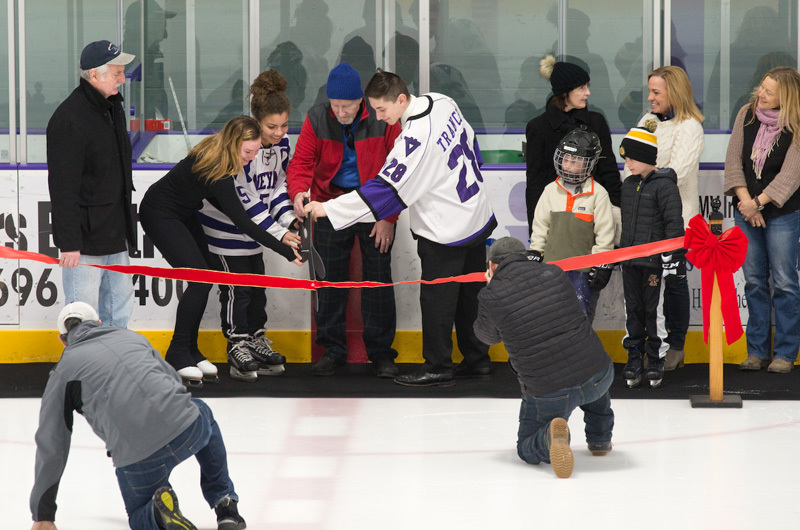 The ice rink has been in use since September, but on Saturday past and present board members, employees, and athletes gathered on the ice for a formal ribbon cutting ceremony. “It’s the first time we’ve been able to get all these old board members and past presidents and everybody around at the same time,” said general manager Peter Lambos. 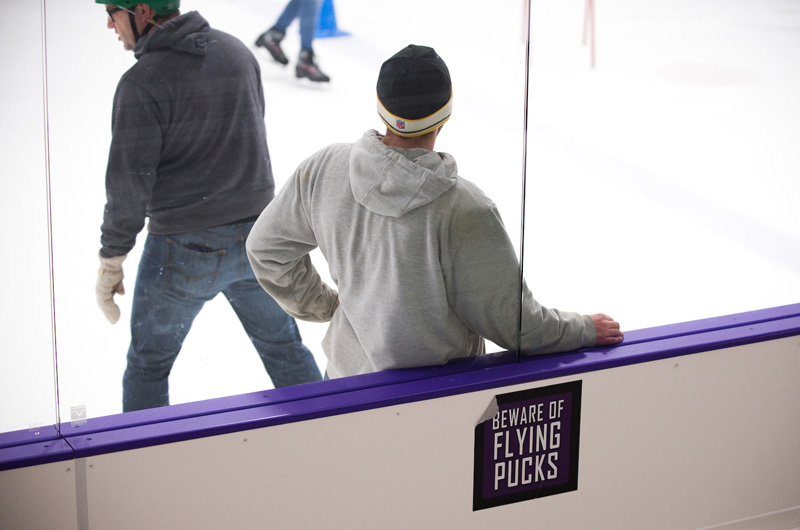 They were joined on the ice by several youngsters, eager to begin their afternoon skate. The $4.2 million renovation began last spring and includes a more energy efficient refrigeration system, new shingles and an upgraded lobby and concession stand. The renovation was funded in part by a major grant from MVYouth. Mr. Waldman said the new, more spacious warm room will be much better for his wife to watch them play. And Dylan looks forward to the new concession stand. On another bench, Madison Packish, 12, held out her skate for her dad, Phil, to tighten the pink laces. She approved of the updates. Mr. Packish played hockey for the Martha’s Vineyard Regional High School as a teenager, and he and Madison spend most weekends at the arena. On Saturday afternoon, Madison got to see her grandfather, Don Lambert, the rink’s first president, have the honor of cutting the ribbon. 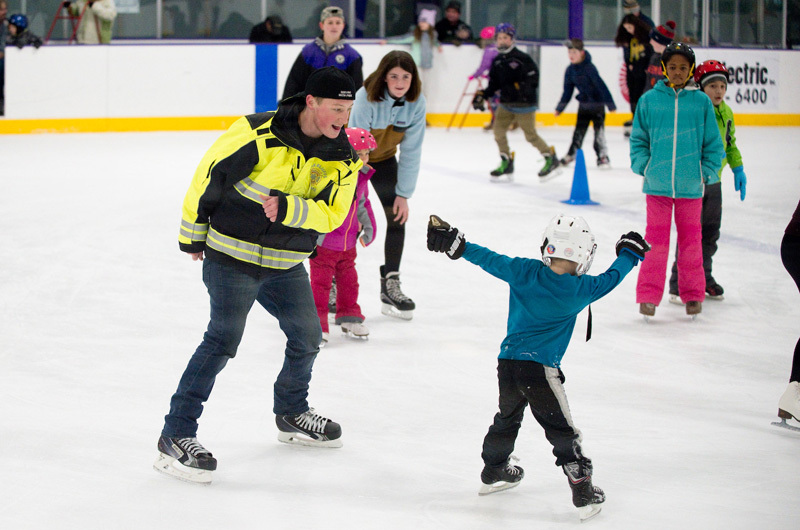 He did so with the help of high school boys’ hockey captain Ian Trance, girls’ captain Sage Araujo, and figure skater Sally Caron. “The systems put in place here should far exceed my lifetime,” Mr. Lambos said. In the winter, the arena is always busy. Between 80 and 90 people come for public skating alone on each day on the weekends. “It’s an Island institution,” Mr. Lambos said.